Here’s a strange coincidence: in the first eight episodes of the show, The Twilight Zone featured three future Batvillains. Pretty neat little average there. 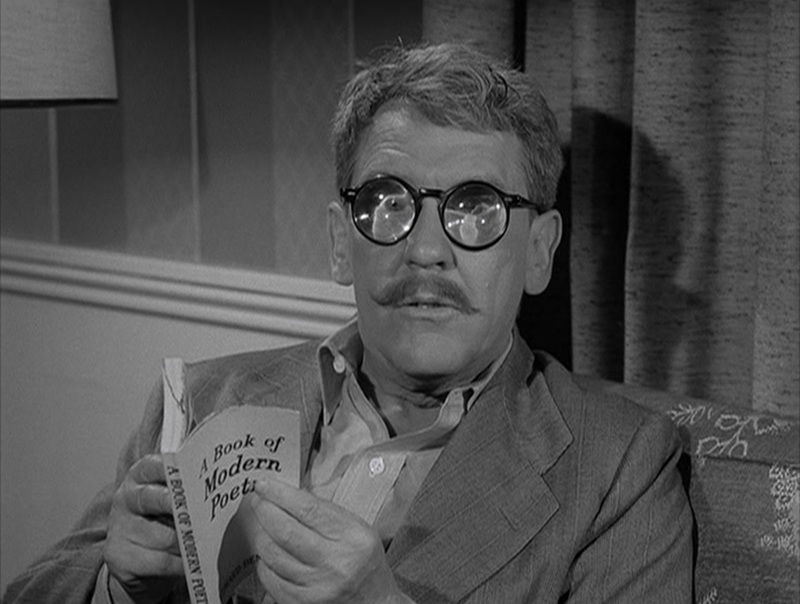 “Time Enough at Last” is the famous one where Burgess Meredith finds himself with all the time to read all the books that he never can enjoy only to break his glasses in a gloomy little twist. But it’s not a satisfying one. I’d misremembered this completely – I saw this one just once, more than thirty years ago – and thought his finale was a comeuppance. It certainly isn’t. It’s a very mean-spirited little story. Our son hated it – he bellowed “Boring!” at the end – and I didn’t like it much either. I wondered how in the world his character, the hapless Henry Bemis, could have ever ended up married to somebody who hates books when all that he wants to do is read. Many decades ago, people would get engaged after holding hands at the newsreel, but these two people are miserable. Some folks complain the divorce rate is too high these days. Some folks shouldn’t have married each other in the first place.